spillyjane knits: New fingerless mitt pattern now available! They're out, and in plenty of time for the holidays, too! 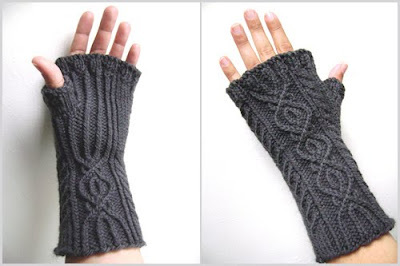 These fingerless mitts (formerly known as the Gauntles, now known as the SpillyMitts,) feature a unique twisted stitch motif, with slightly different detailing on the inner wrist and palm. Get the pattern here on Ravelry! Though these are sized to fit any hand 8 inches in circumference, the rib and cable motif will accommodate a variety of sizes. The 4-page .pdf features large colour-coded charts to make the twisted-stitch-knitting process as painless as possible. And much like with the Heirloom socks, to make these mitts you're going to need to know how to knit through the back of the loop, cable, read charts and knit in the round. Wait til you see what's coming next! October 15, 2009 at 10:34 a.m.
October 15, 2009 at 11:13 a.m.